Today in music class, all of the students got together for the last recital of the semester. 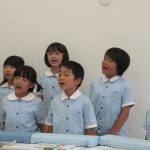 First, the first graders played Dongurisan no Uchi on the pianica followed by the second graders with Doremi de Asobu. 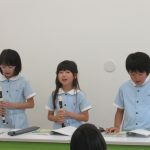 Last, the third graders sang and played Todokeyou Kono Yume Wo on their recorders. After that, all of the students stood together and sang this month’s songs, along with many other songs they learned this semester. It was a great way to end this semester’s music classes.